....I had planned to spend 2 or 3 days on Skye again, just scrambling. But the weather god didn't play ball: the only thing I'm as apprehensive about as avalanches is lightning, and the forecast was for thunderstorms all week over the Cuillins. Indeed this seemed to be the picture for the whole of the west coast - from south to north, including Snowdonia and the Lake District. 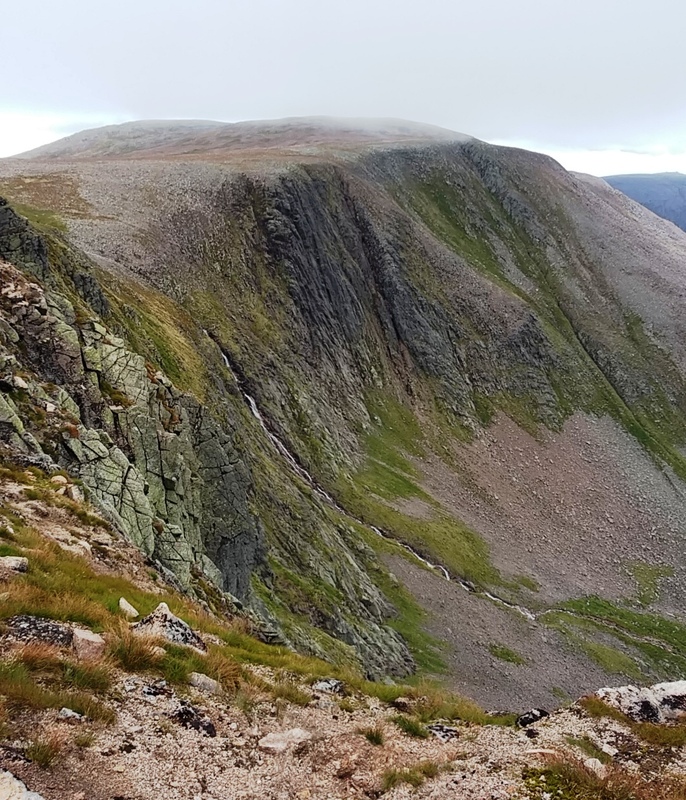 The only place that looked like it might have quarter way reasonable weather was the east, so - inevitably - I ended up with the Cairngorms as my destination. 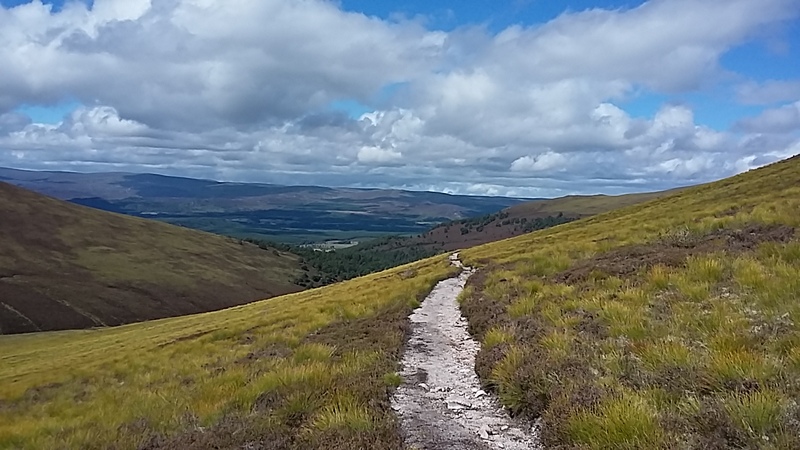 About this time I read Malky_c's account of his "meander" through the Cairngorms with Jaxter, whereupon the idea of setting off without any fixed plan suddenly seemed very appealing. There were a few possible places I fancied visiting, or revisiting - Loch Einich, Loch Coire an Lochan, Braeriach and Coire Bhrochain if the visibility was good, Loch Etchachan, and possibly scrambling on The Devil's Point - but the only thing I really fixed on was the start point: Glenfeshie. 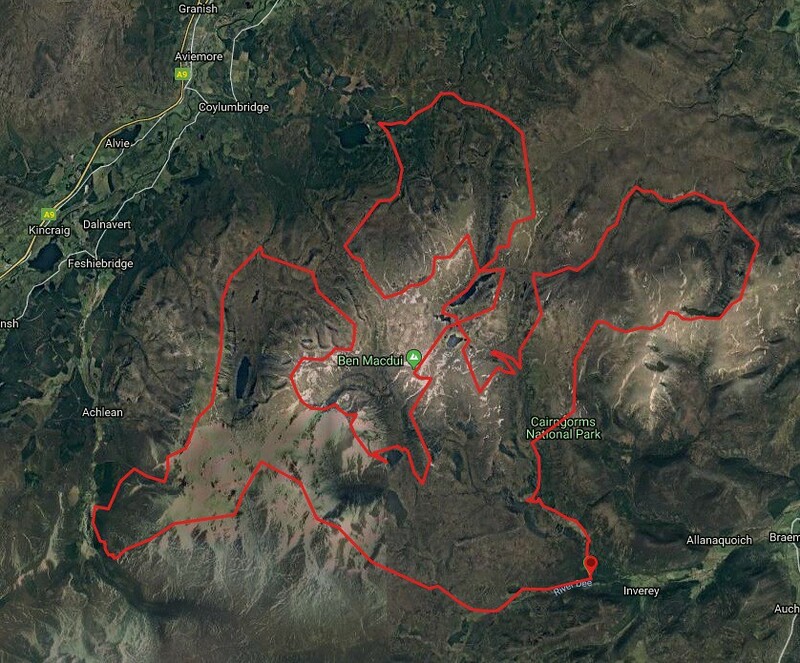 This is the route I ended up taking. I parked up close to the gliding school, and was under way at about 18.30. The sun was shining, but there was a stiff breeze, so good for walking. The idea was to get up to a reasonable height as quickly as practicable on the first evening, and do a summit camp. So I headed straight for Creag Mhigeachaidh. It doesn't look it, but it's not far short of 400 metres of climb - definitely something to get the circulation going from the start! 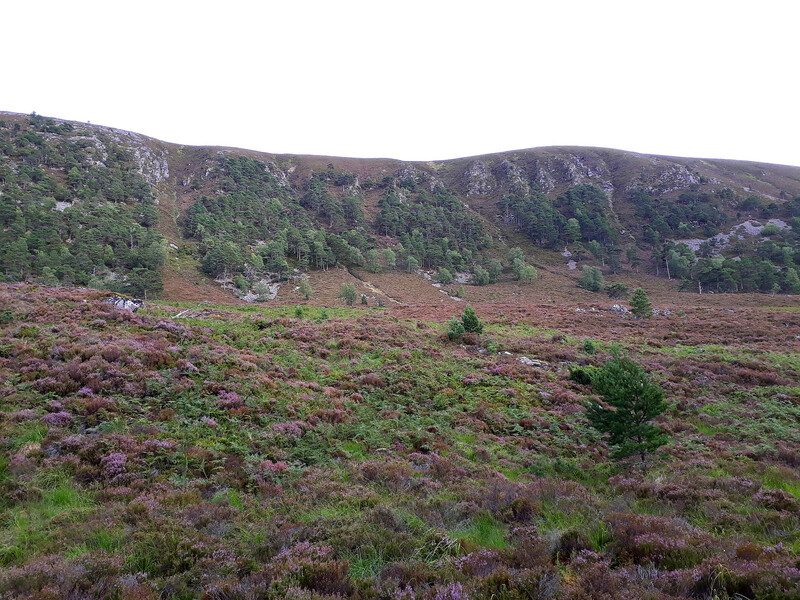 After a short stretch on a track through the forest, I was into rough heather country and looking at that first climb - about 300m of it is visible on this pic. About half way up I looked ahead and saw above me, almost silhouetted against the sky, a peregrine. This seemed like a good omen: if I now see a dotterel and a goldie during the course of the walk, it will have been perfect. 20180807_191339. In my haste to get under way, I forgot to take a full water bottle, so I was reduced to filling it from dribbles like this! 20180807_191345. Looking down the gully I'd just ascended - it was MUCH steeper than it appears to be on this pic. 20180807_192008. Raising my eyes a tad, the view looking roughly WNW, close to the top of the gully. After the top of the gully the slope slackened off considerably, so the pull up to the very flat summit of Creag Mhigeachaidh was much easier. 20180807_194717. 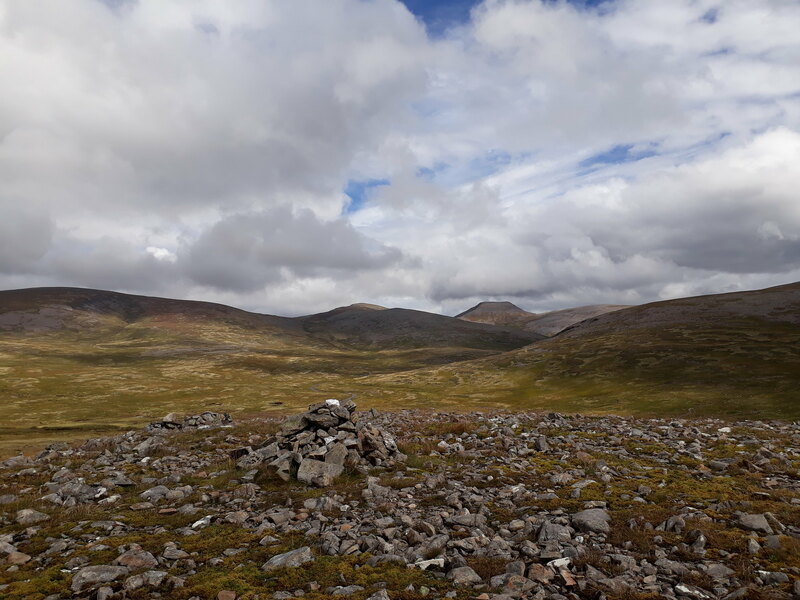 This is the view looking north east from the summit towards Creag Dhubh and Clach Choutsaich...(note the weird cairn about a quarter of the way in from the LHS, about 50m north of the summit... what's that about..???). 20180807_194726. 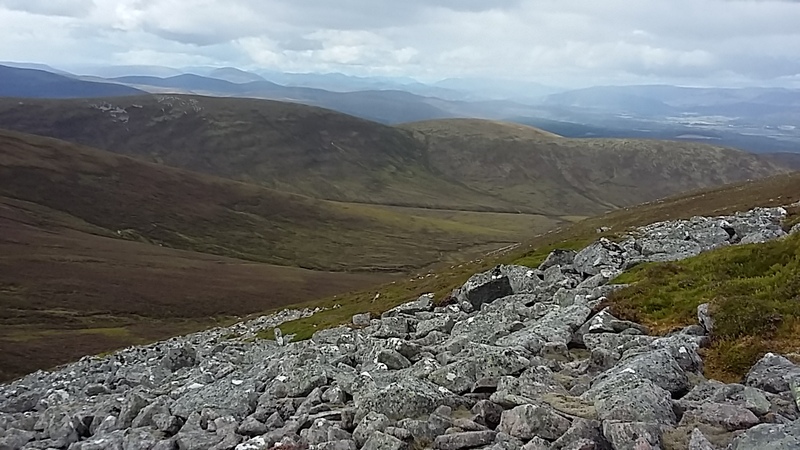 ...and this the view looking south west ahead to Geal-charn. 20180807_195625. 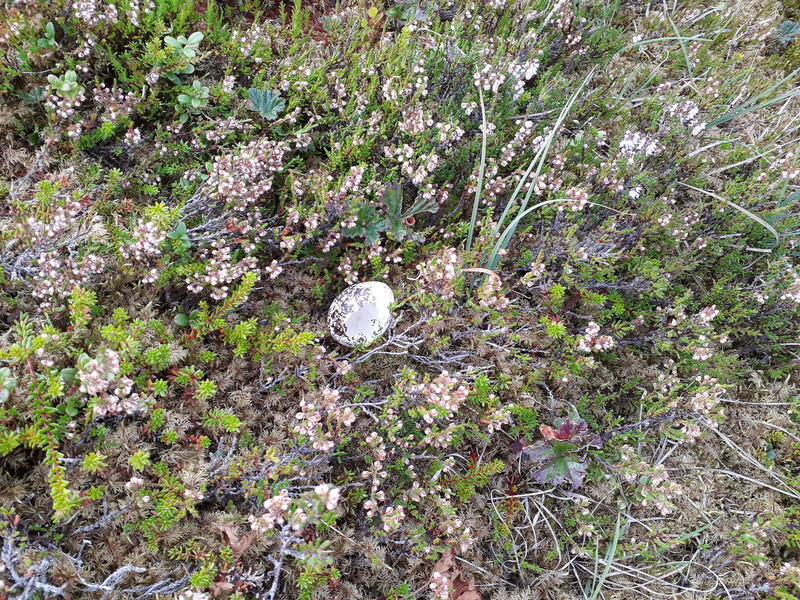 A (hatched) golden plover's egg just lying in the heather. 20180807_203857. Approaching the summit of Geal-charn looking south east towards Sgoran Dubh Mor. 20180807_204709. 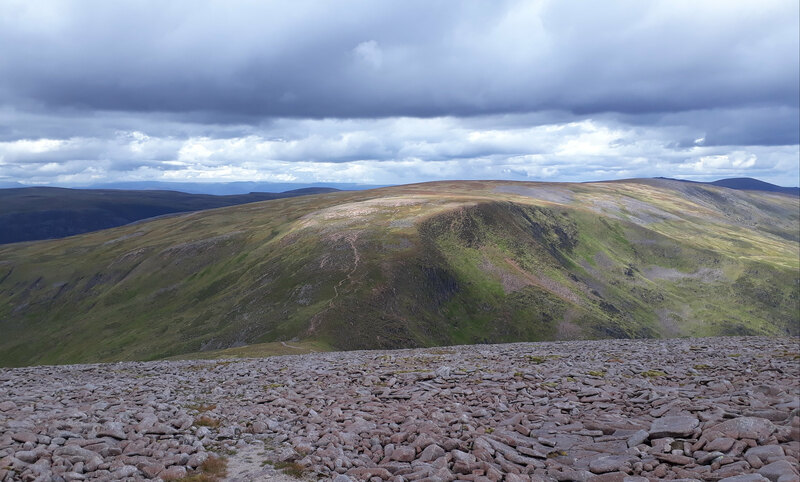 As the previous pic, but taken 10 minutes later from the summit of Geal-charn, showing how quickly the sky and its shadows cast on the landscape were changing. 20180807_205056. Quickly, before the sun set completely, I tried to find a vantage point to get a good pic or two of the sunset, without a huge amount of success. But. looking just north of east, I did manage get this pic of Lurcher's Crag illuminated by the now almost horizontal sun, and looking quite superb. 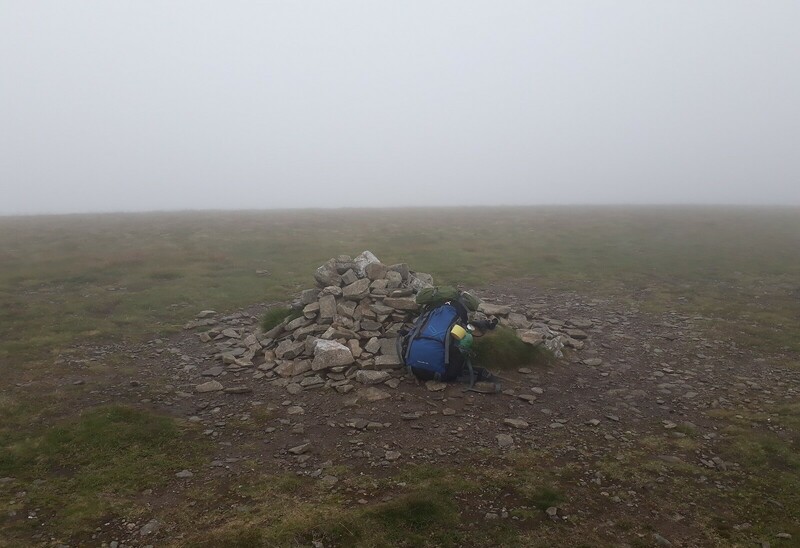 There was a really brisk breeze at this point: I was getting quite chilly in my malky_c style shorts, and it seemed to me to be far too windy for camping on the summit - so the pressing need was to find a more sheltered place that was flat enough to pitch my tent. 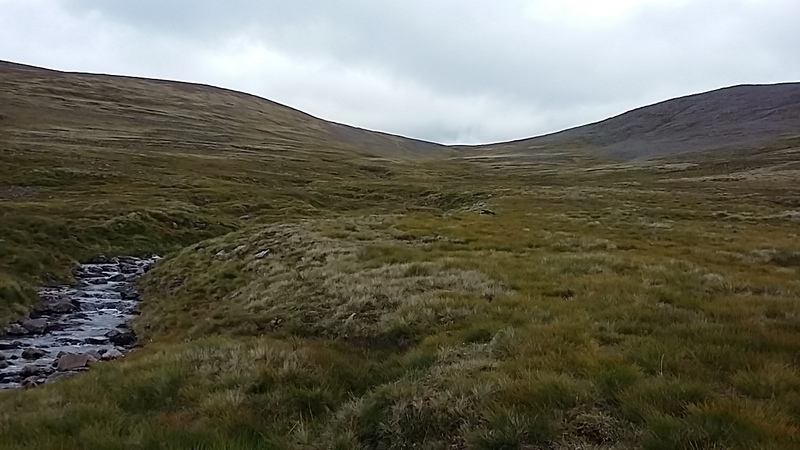 As I descended Geal-charn, there was a bit of a gully, and dropping 50m in a NE direction seemed to provide a bit of shelter. In fact the shelter was only partial, as I discovered during the night when the wind got up. I woke up in the small hours with the tent flapping like crazy, and from then on slept rather fitfully until dawn. It was astonishingly cold also: I had to make use of my sleepingbag hood to remain warm, and I was using exactly the same mattress and bag that I've used in the depths of winter . 20180808_060511. Tent in "sheltered" pitch! 20180808_063148. ... and I was soon packed up and on my way. It was still very cold and windy, but a brisk pace (at least to start with...) got the circulation going. 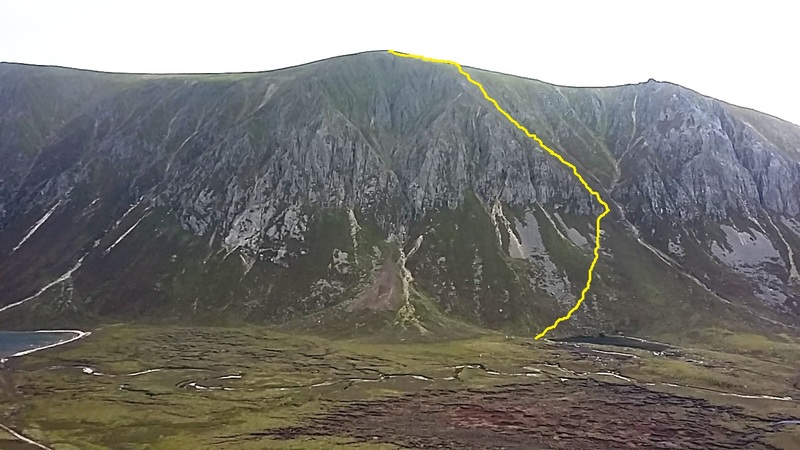 Before turning in the previous night, I'd scanned the map a bit, and decided that at least for the first part of the day I'd walk along the west ridge above Loch Einich, so my first goal for the day was Sgoran Dubh Mor, via Meall Buidhe. 20180808_071953. ... and ahead to Sgoran Dubh Mor. While taking the first of these last two pics, my map slipped out of my grasp and on to the ground. I was in the middle of lining up a shot, so I decided to retrieve the map when I was finished. And I'm sure you can guess what happened. Fortunately, I'd only got as far as the next hump, about three quarters of a mile from Meall Buidhe, when I realised my loss. 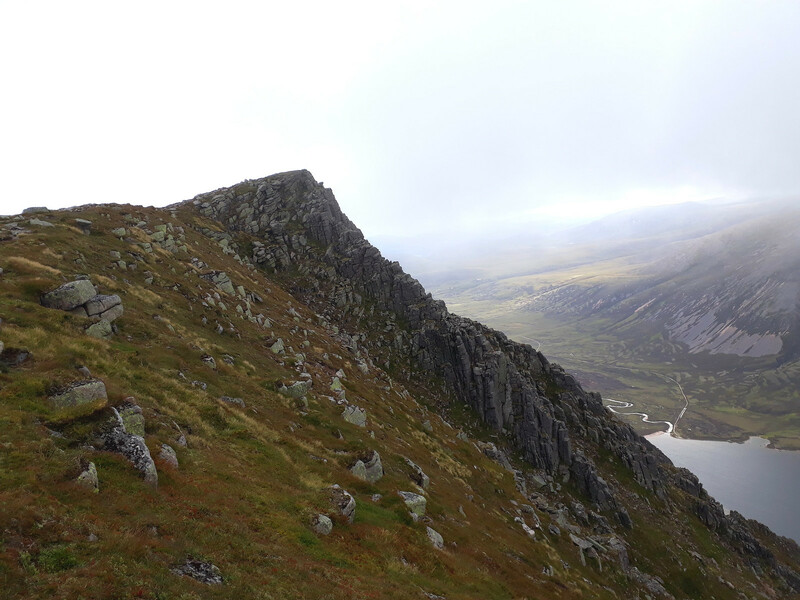 Leaving my sac on the summit of the hump, I jogged back to Meall Buidhe. But when I got there, every bit of ground looked more or less identical: turf and boulders, and more turf and boulders! Fortunately, I realised that I should be able to get very close to the position I was in when I took the pictures taken earlier by aligning what I could now see in the viewfinder on the camera with my pictures. And sure enough, once I'd done this, I found myself within a few metres of the map. Idiocy seems to be a state of mind it's hard to get out of! 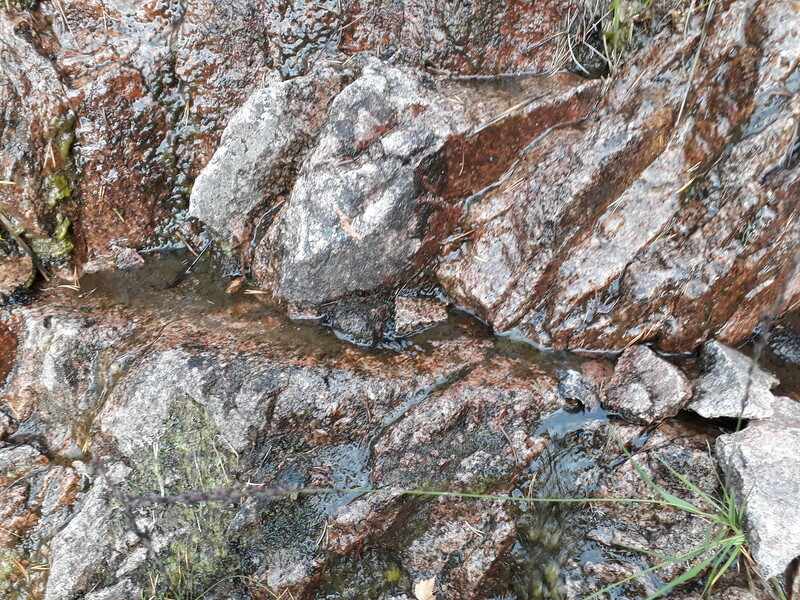 After that, the ascent of Sgoran Dubh Mor was quite straightforward - I just made a slight detour to a tiny watercourse to get some water, as I was still very short. 20180808_080816. 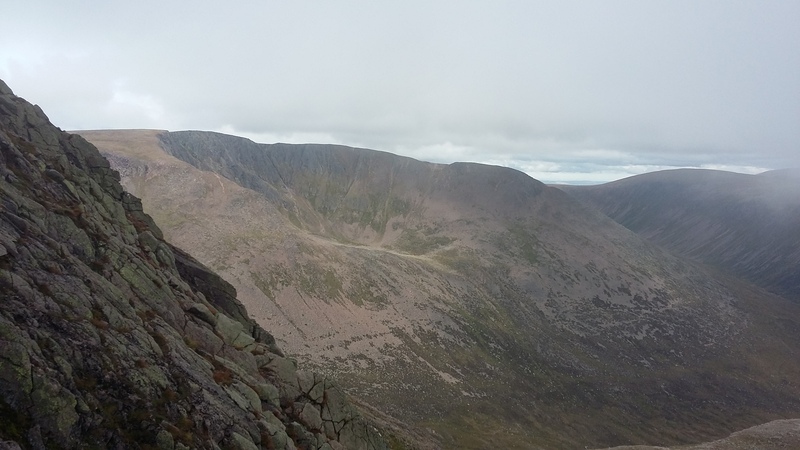 Here looking back along the ridge I've walked so far, taken from the summit of Sgoran Dubh Mor. 20180808_081223. And looking east towards a cloud-shrouded Braeriach. As I walked along the edge of the dramatic cliffs that fall abruptly 600m, I had plenty of opportunity to appreciate Loch Einich, which was every bit as spectacular as could be surmised from the map. 20180808_083847. ... and this looking back towards Sgoran Dubh Mor. 20180808_084207. Looking back north towards Sgor Gaoith. 20180808_084757. ... and again from a bit further along the ridge. 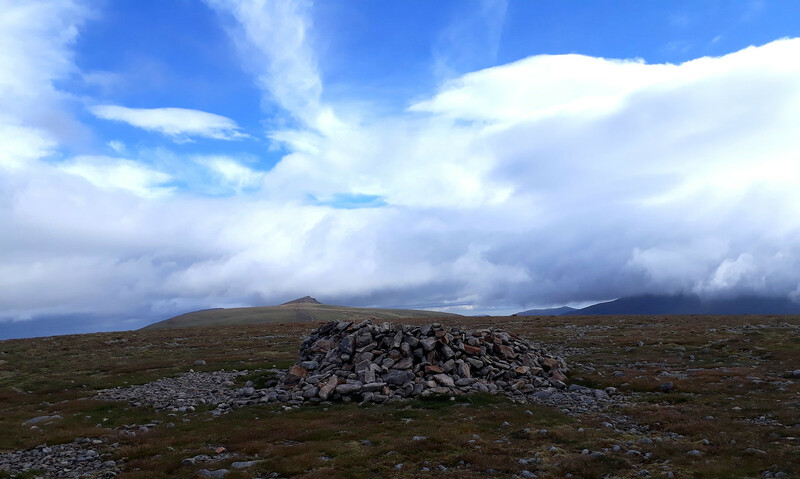 2. more or less the same, but via Mullach Clach a'Bhlair, for no other good reason than that it is a Munro - with the risk that I may run out of time to include some other goodies. 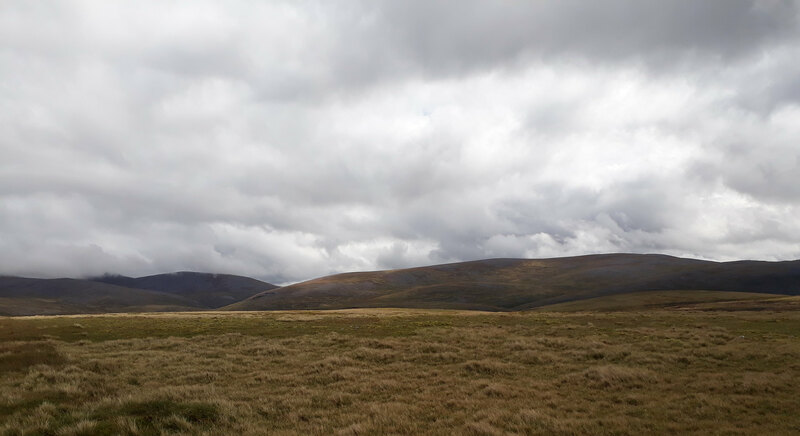 However, there is a rather bleak grandeur about the terrain between here and Mullach Clach a' Bhlair, and as it's quite flat, it looks like progress should be quite quick => still possible to get to Devil's Point in plenty of time. 20180808_090051. ... before heading towards MCa'B. 20180808_094128. 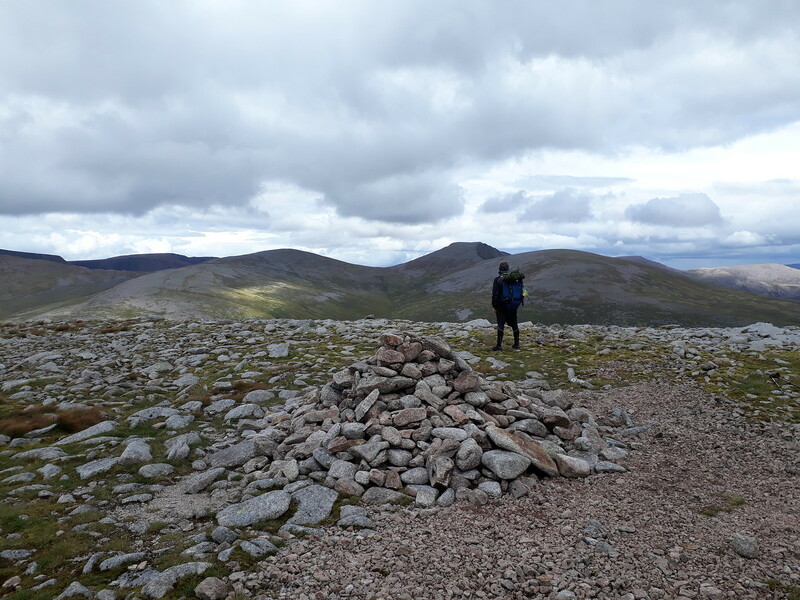 ... and Meall Dubhag (in the background, right - this pic is taken from the south top of Carn Ban Mor; Mullach Clach a' Bhlair topped with clag in the far background, left). 20180808_101000. Descending gently from Meall Dubhag in a roughly SE direction along the north and east edges of Coire Garbhlach, the cliffs on the south side - which I'd noticed on the map - showed to fine effect. 20180808_111741. ...another startlingly dramatic summit (Mullach Clach a' Bhlair). Not as impressed as I probably should have been , I determined to move on as quickly as possible, and so followed the track this time. 20180808_122416. Within about three quarters of an hour the rain had blown over - cue: massive improvement in mood! (another example of the St Neots Margin ). 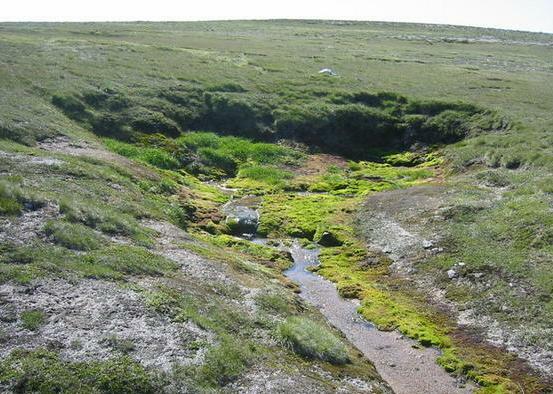 I even found looking back whence I'd come to MCa'B pleasing - impressively bleak upland, all not far off 1000m! 20180808_122619. 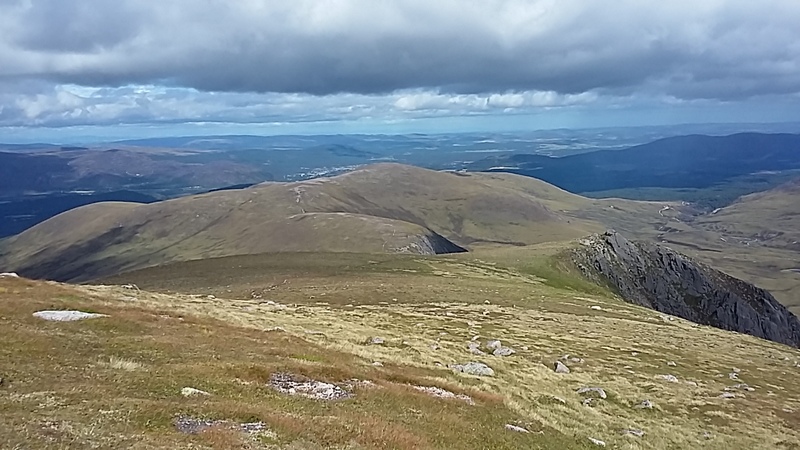 And looking roughly NE, Braeriach in the centre middle background. 20180808_130304. 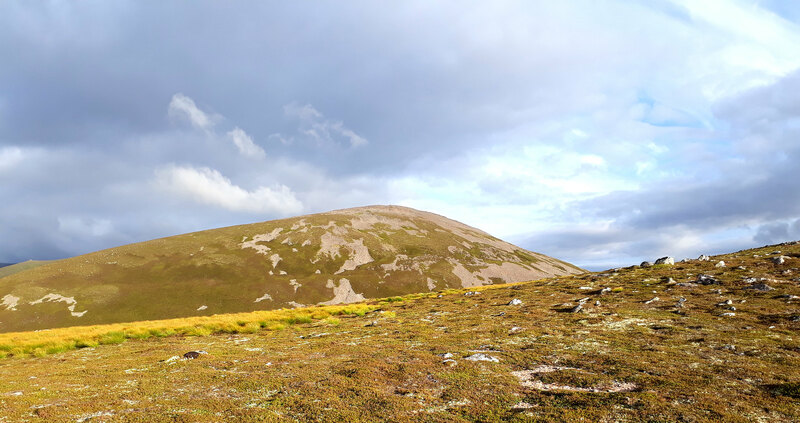 The same from Tom Dubh - not sure why there's a cairn on this hill ??? But anyway, it's a good viewing point, so I stopped here for a couple of cheeze-salami-and-Branston-Pickle sarnies, and to ponder the world. Just as I set off towards Monadh Mor, a fellow walker passed about 100m further north - it wasn't clear where he was going, as he seemed to be heading well south of Monadh Mor. 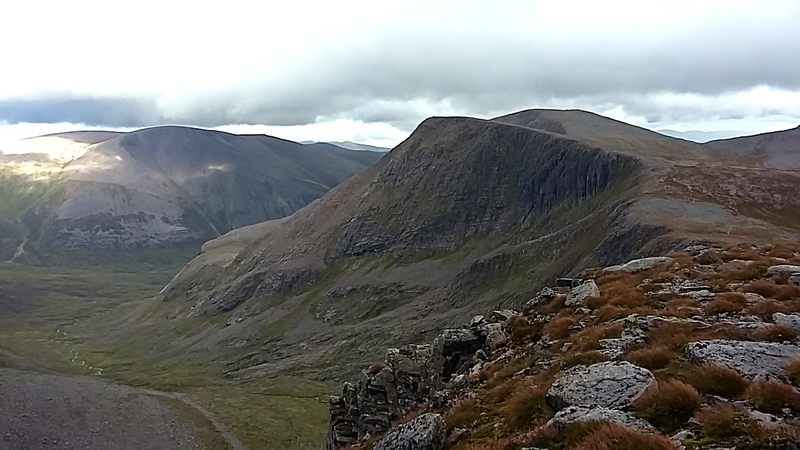 Then an easy plod up to Monadh Mor. I walked initially eastwards with the idea of getting a view down into Glen Geusachen, but the upper part of the hill was too convex, and there wasn't much to see. I arrived at the summit a couple of minutes after the walker I'd seen earlier - he'd clearly aimed for the ridge first, and then walked along the crest of the ridge to the summit. 20180808_140841. And he very kindly took this someoneelsie (looking north), just to remind myself that I really had been on MM! He was the first person I'd seen or met up with all day, and this soon became a real "London bus" moment, because a couple of other guys also arrived within 5 minutes of each other, and none of them had seen anyone else all day either! One had just come from Beinn Bhrotain - which I quite fancied the look of - and told us he was heading to camp at Lochan Uaine. This caused me to reconsider my plans, which up until this point had been to go to Devil's Point and try a bit of scrambling on the east face. 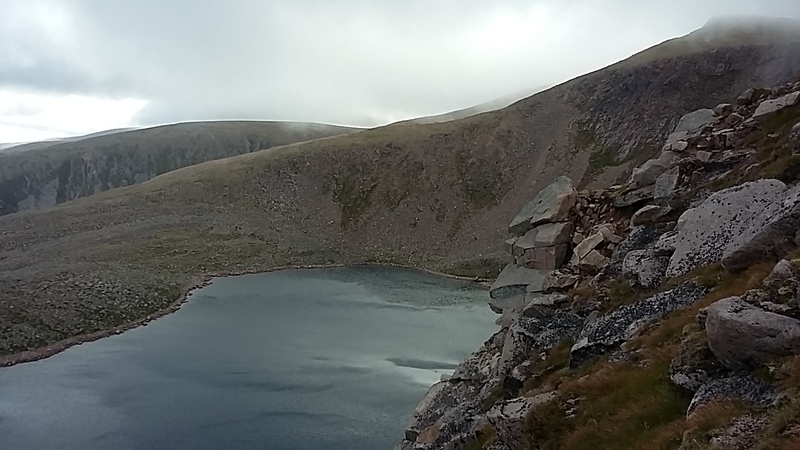 Ever since I first viewed Braeriach from Sgor an Lochan Uaine in September 2016, I've been fascinated by Coire Bhrochain. I'd passed over Braeriach and Carn na Criche in quite dense clag, and so failed to gain any meaningful impression of what the area was like. 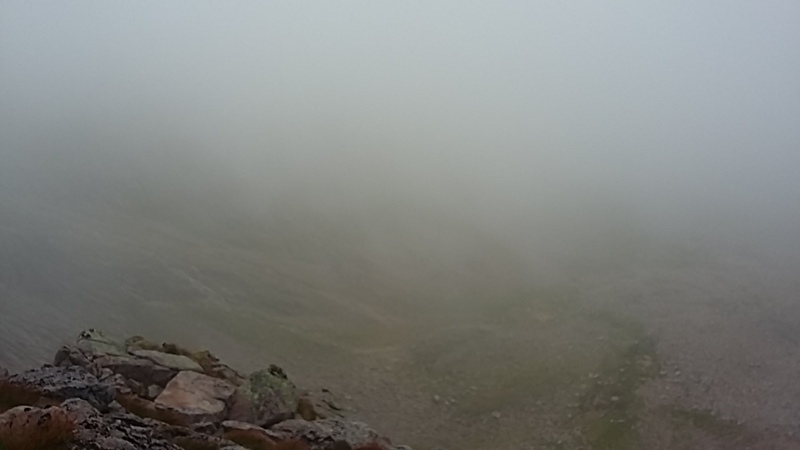 It was only when the clag began to clear while I was lunching on Sgor an Lochan Uaine that I saw Braeriach and Coire Bhrochain; and I was stunned. The impression of immense mass and age were extraordinarily powerful, such that I just stared and stared - and then shot off 10 or 20 pictures, none of which really seemed to capture adequately its character. Quite why I find this particular corrie so especially fascinating - as compared with, say, Coire an Lochan Uaine - is hard to say. 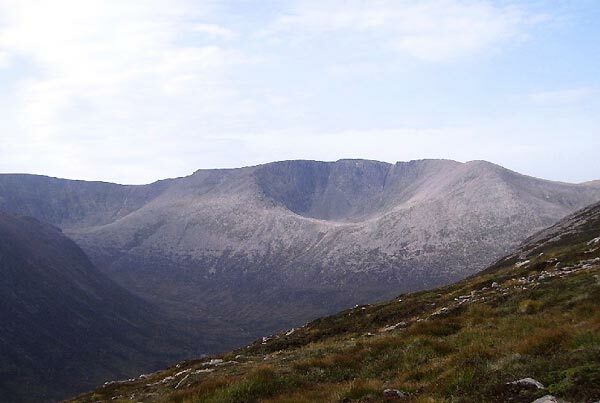 But I think it's fair to say that from any distance, it is the most dramatic of the corries that fringe the east edge of this ridge. Library pic, taken from the Ben McDui side - pretty iconic.
. ... and a last one taken from 30km distance, and half-inched from EmmaKTunskeen's prize-winning report. 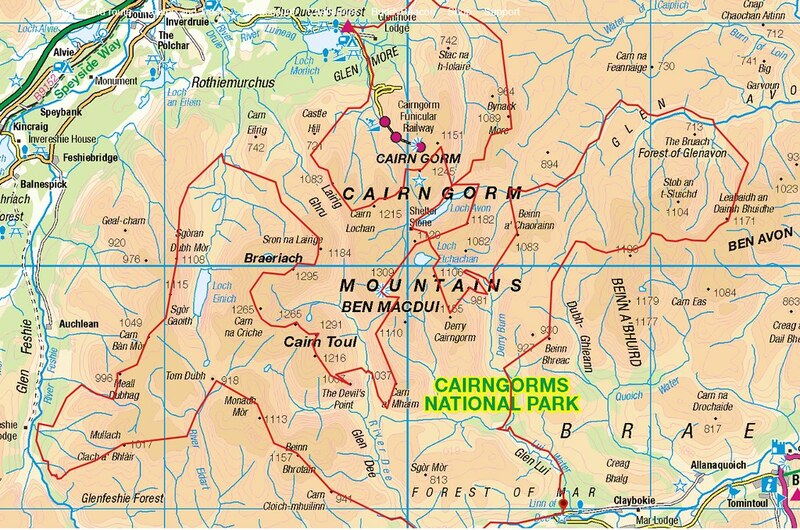 Anyway, the guy's plan to camp in Coire Lochan an Uaine sparked in me the idea of doing the same in Coire Bhrochain, and as soon as the idea entered my head, that was it. It would mean an "out-and-back" visit to Bheinn Bhrotain (which type of route I don't much favour) since I first wanted to "bag" it since it was now so close and easy to get to. It certainly looked worth a visit. So after a bit more blether, this is where I set off to first. 20180808_143330. Bheinn Bhrotain viewed from somewhere around Liac Ghorm. 20180808_145643. 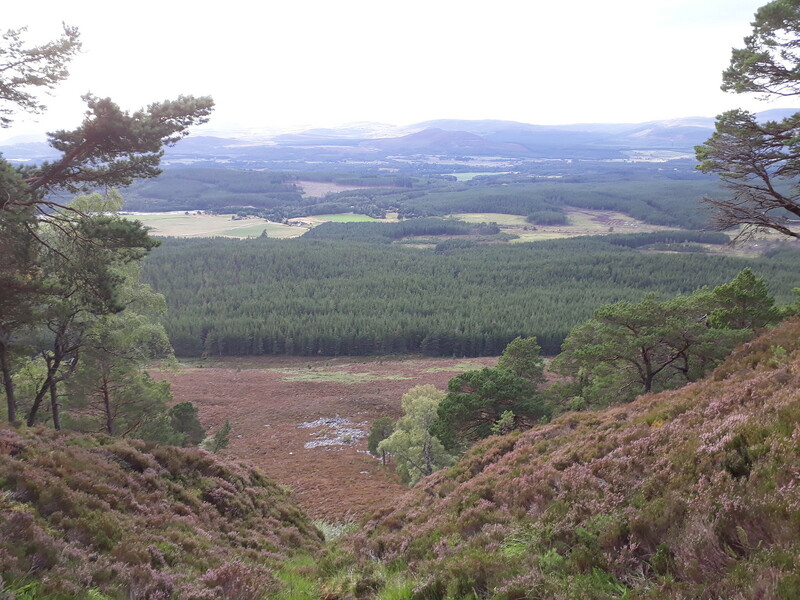 ... as can be seen from this pic, taken looking back north west towards Monadh Mor. After this, it was back to the way I'd come to Monadh Mor, down the ridge and into the valley, and then up the west side of the Allt Luineag to the point where it starts, a little below the bealach between Sgor and Lochan Uaine and Carn na Criche. 20180808_170520. It seemed like quite slow going, though I guess with not far short of 500m of ascent it was never going to be very speedy. 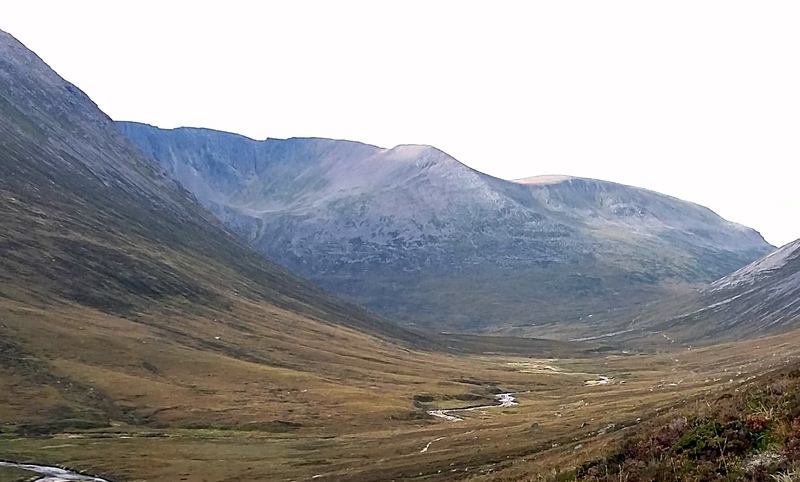 This pic is taken looking from the lower part of the Allt Luineag mini-valley, looking up towards the bealach between Sgor and Lochan Uaine and Carn na Criche. 20180808_175207. The views from the top were well worth the slog though - this looking towards Sgor an Lochan Uaine from the edge of the ridge. 20180808_175942. ... here in close up, probably too close up). 20180808_181303. Really good to see the Falls of Dee at last, having last time only seen the water disappearing off into the mist. I took advantage of the weather, clear though very cold and blowy, to wander around the springs that feed the Dee - most impressive - something about water springing out of the bowels of the mountain mass. But I didn't hang around too long: now walking on the flat, or a gentle slope, I was getting quite chilly, and I was really hoping that Coire Bhrochain would be sheltered from the worst of the wind - it seemed like it ought to be, since with the wind in the present direction, it was in the lee of Braeriach. 20180808_183332. A last look south east down Glen Dee - with Coire Lochan an Uaine looking quite dramatic on the RHS - before heading down the south shoulder of Coire Bhrochain. 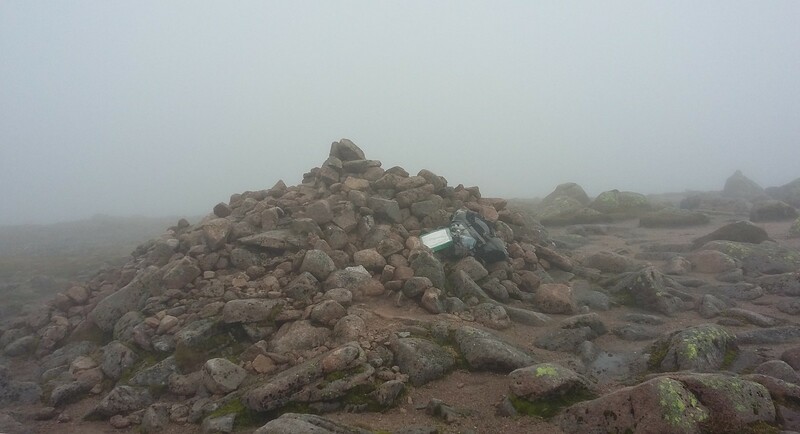 I had thought of going first to Braeriach summit, just to be sure of the views. But it was already in cloud, and I was cold and hungry, and keen to get my tent up. 20180808_183833. This pic is taken at the point at which I cut straight down the side of the shoulder into the corrie. Wonderfully, the wind dropped to almost nothing as soon as I got slightly below the shoulder ridge. The descent was steep, and a bit slow, but not too difficult. Of more concern was the appearance of the corrie bottom - which didn't look very promising for a reasonable pitch! 20180808_185506. However, as I descended, I spotted a stone shelter circle with greenery both within it, and in its vicinity, so my hopes of a decent pitch rose correspondingly. 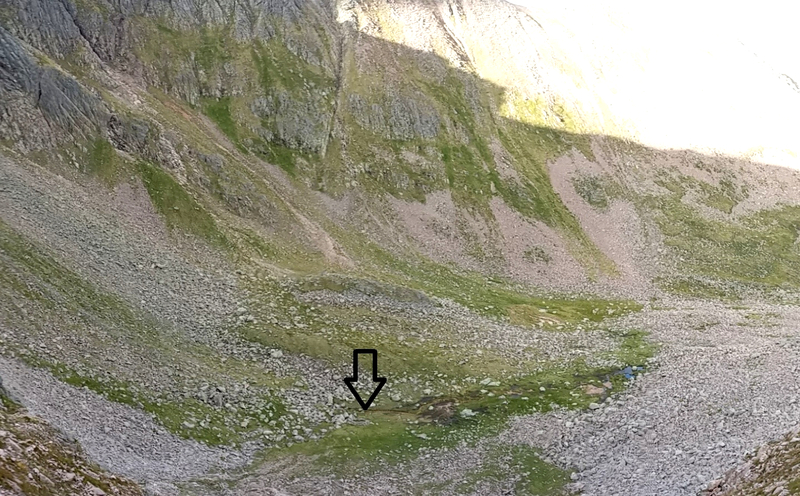 Stone shelter circle, and eventual Coire Bhrochain tent pitch. Once I got into the corrie bottom, I found that the wind had really picked up - I suppose it was swirls from the main wind above, since it was mainly blowing in the opposite direction to the prevailing wind. 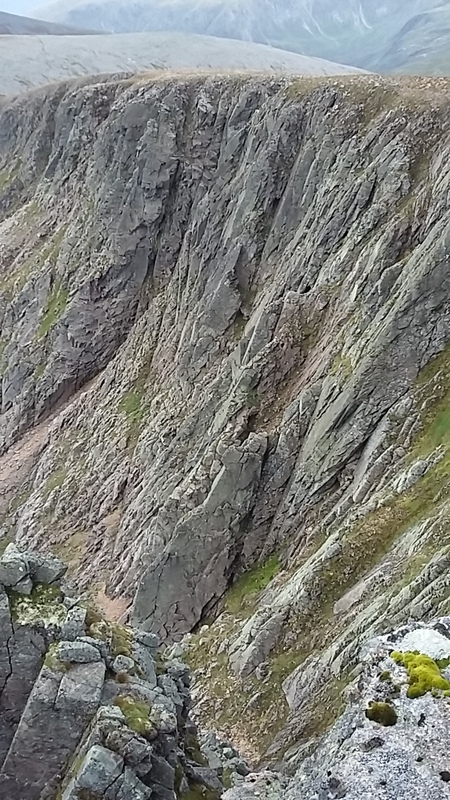 There were some flat bits of ground out in the centre of the corrie, but they were subject to strong erratic gusts. So I went to investigate the area near to the stone shelter circle. Within the circle I found that the ground was just a bit too rocky for me to risk my lightweight groundsheet. But a couple of metres outside it, right beside a spring rising from the base of cliffs, was an area of some square metres sufficiently free of large part-buried rocks on which I could just fit the tent - though one of the pegs for a stay guy was within a few centimetres of the wee burn flowing from the spring. 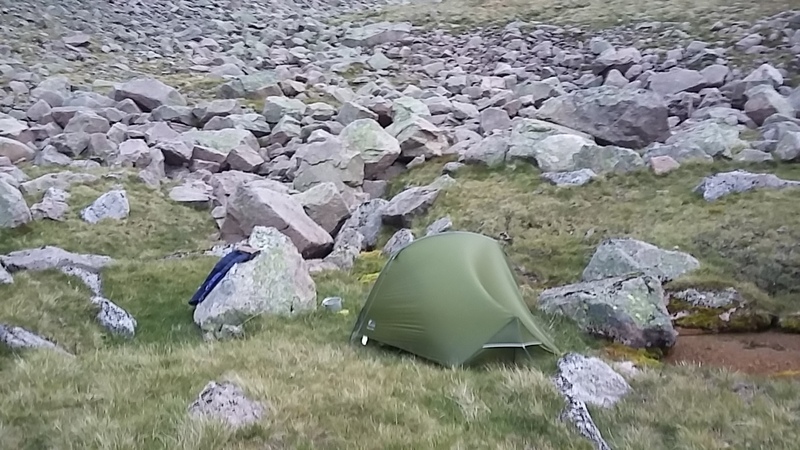 It was still quite windy here, but not as strong as further out in the corrie, so this is where I pitched the tent. A trek meal soon warmed me up, and though I again needed to use the sleeping bag hood, I slept warmly. But fitfully, once again being woken up frequently in the night by the wild flapping of the tent. 20180809_060049. Pic of the pitch taken the following morning - the wind is pretty evident in the shape of the tent! 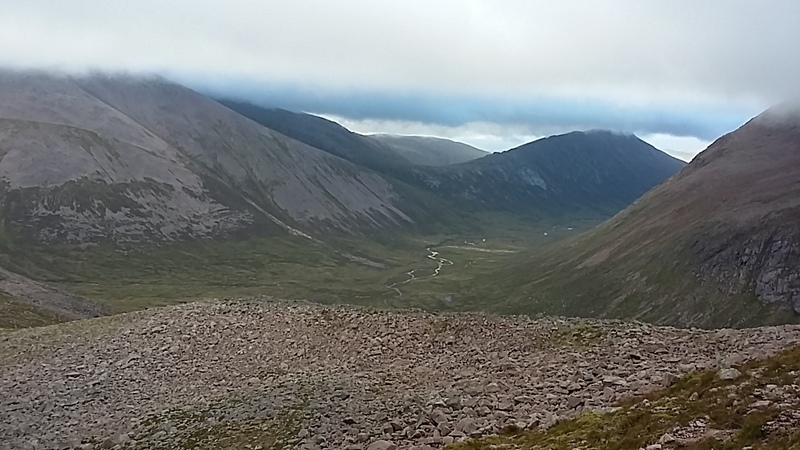 Unfortunately all the tops, including the upper cliffs of Coire Bhrochain, are shrouded in cloud the next morning, as can been seen on this pic looking south east down Glen Dee. It was an easy upclimb to the cliff tops, but by the time I got there the clag was well and truly down. 20180809_075404. 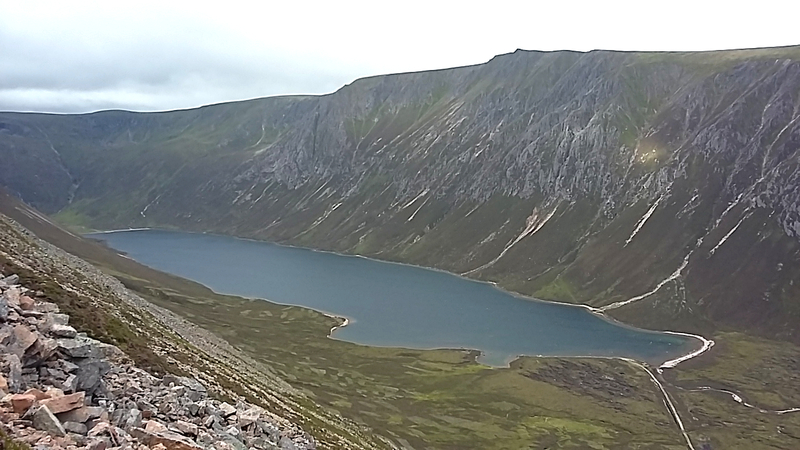 This was one of the fleeting moments when I could see the bottom of Coire Bhrochain. 20160907_115806. ... and this one. Yep, the latter was taken in September 2016, otherwise much the same . 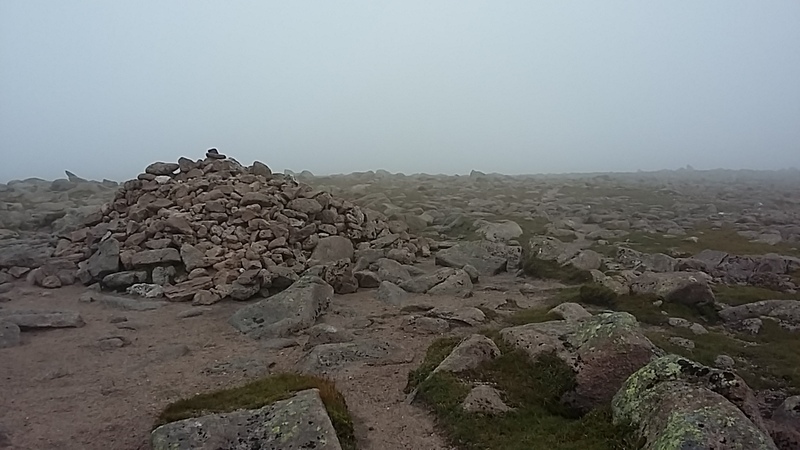 It didn't look like the clag was likely to clear any time soon, and the forecast was also a bit iffy, so I decided to head for Coire an Lochain, a straightforward yomp across the plateau. 20180809_083035. With all the scree slopes it looked quite bleak, and I was glad I didn't end up camping here - which had been half a thought at one point. [20180809_084913. It was interesting to see the wind patterns swirling on the loch surface, demonstrating that the lee of a hill is actually not much of a lee! As Sgoran Dubh Mor came into view again, I decided to go for a view looking up Loch Einich from it's north side; so instead of dropping straight down into Gleinn Eanich, I semi-contoured around the broad west shoulder of Coire an Lochan, descending gently through the extensive boulder-and-grass field - quite slow going. But the view certainly repaid the effort. Now the question was: where to cross the hills ahead to get back to Glen Feshie. 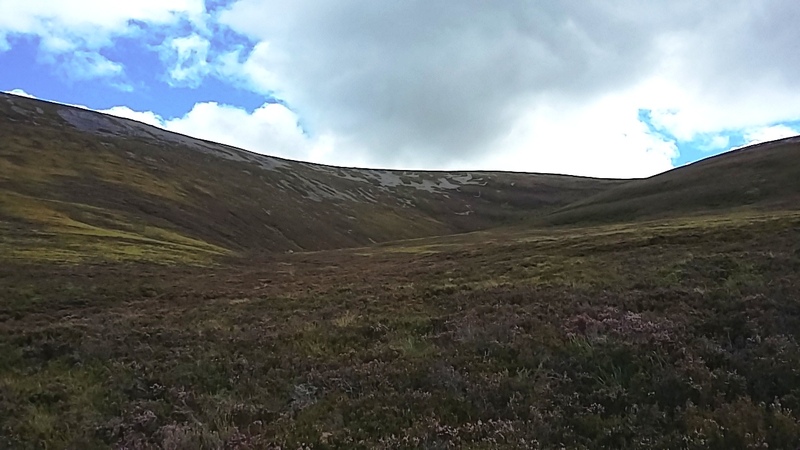 However I looked at it, and wherever I looked, it seemed like a steep rough climb was unavoidable - something like 600m, and much of it through what looked like deep heather and boulders. 20180809_095037. This was the ascent route I ended up taking. The first two thirds was a slow slog through what indeed turned out to be deep heather and boulders, a good part of it negotiated on all fours! 20180809_114912. View back down from the top of the gully - boy, that was hard work! [20180809_120226. 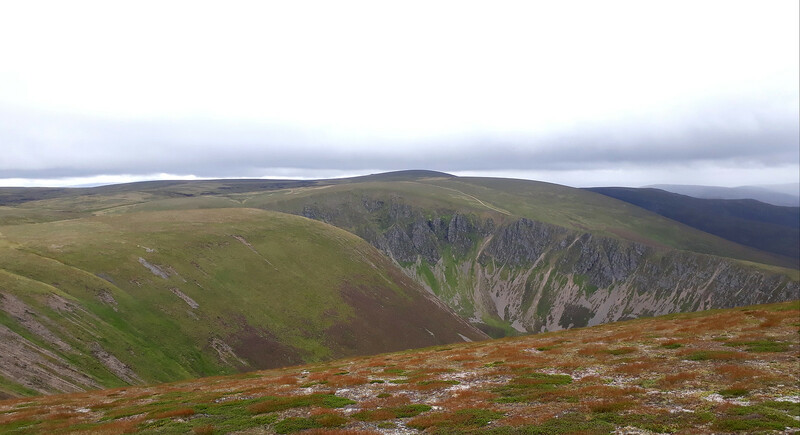 And looking across at Braeriach, the immutable action of Sod's Law having resulted in it now being clear of clag . 20180809_121541. Looking north along the ridge from the summit towards Creag Dubh. 20180809_121843. 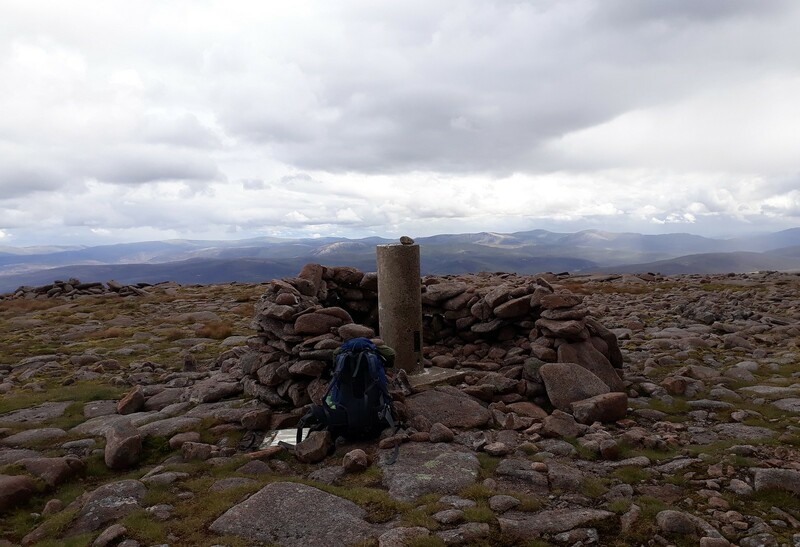 And the summit cairn - again! Here I sat down to think about the route back. 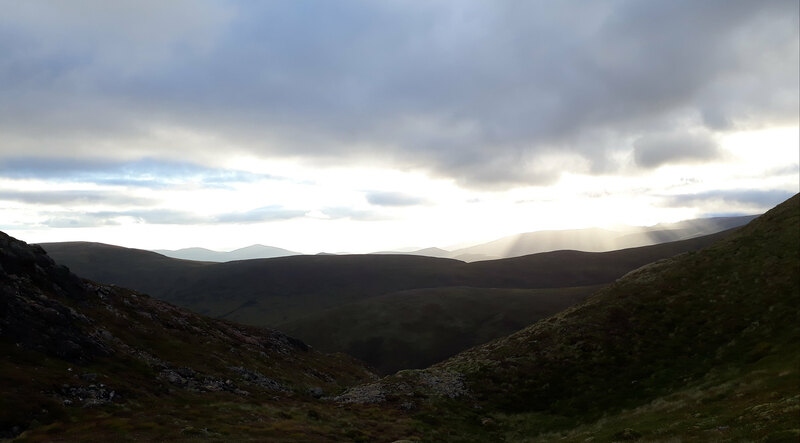 Not hard enough, for I ended up concluding that, regrettably, the only half-decent route would be largely back the way I'd originally come, but dropping off the ridge just before Geal-charn to join a track that then ran most of the way through the forest to where I'd parked up. Reluctantly, I heaved myself to my feet and set off down the hill. 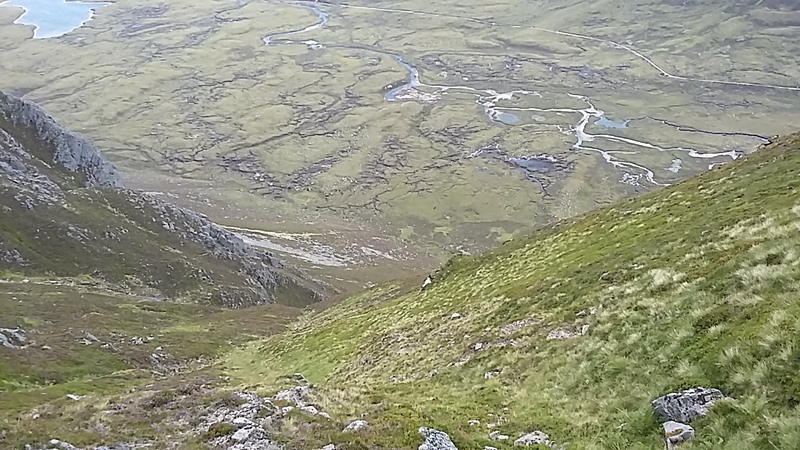 On reaching the bealach, where the route along the ridge turns north, I was feeling less and less like retracing my steps, so I took a look at the map again. And realised that quite a reasonable looking route would take me down the glen of the Allt a'Chrom-alltain, and then parallel to the ridge at lower level. Done. Slight change in direction, and I continued on down. 20180809_123928. The terrain was a bit rough in places, but generally OK.
20180809_130801. 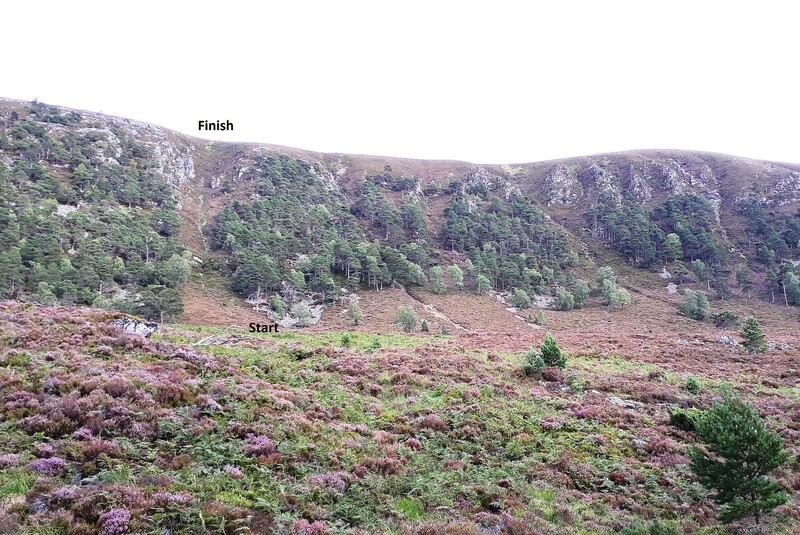 And the track, once I hit it, was superb - and unlike many other tracks in the Cairngorms, is actually shown on the map! 20180809_132010. A little later, looking back along the route I'd originally intended coming down, I could see I made a good choice - it looked like a serious heather bash! 20180809_132614. 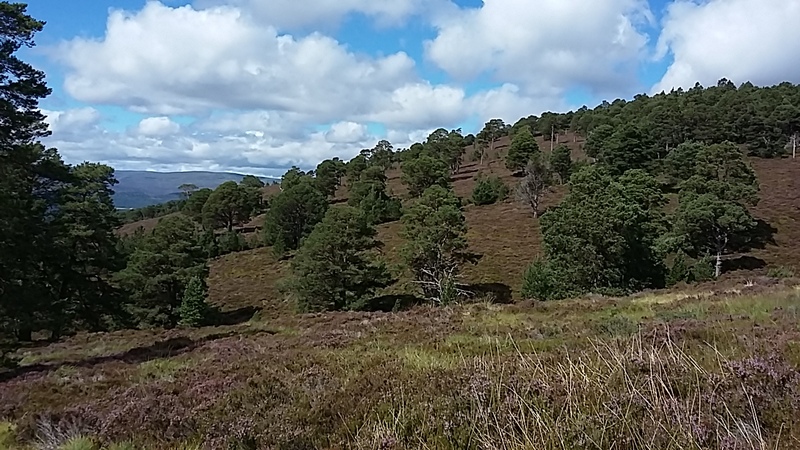 This aesthetically pleasing replanting of conifers stands in stark contrast to the vast areas of forestry monoculture in this area - pity it couldn't all be like this. A nice walk, principally through forest, saw me back at the car at 14.15. All in all, an excellent preparation for at least 3 months enforced walking inactivity. It felt quite odd to be setting off without clear goals, and changing them on the fly from hour to hour, but it was thoroughly enjoyable. Last edited by Alteknacker on Wed Sep 05, 2018 10:47 pm, edited 2 times in total. Fantastic images of an epic exploration! 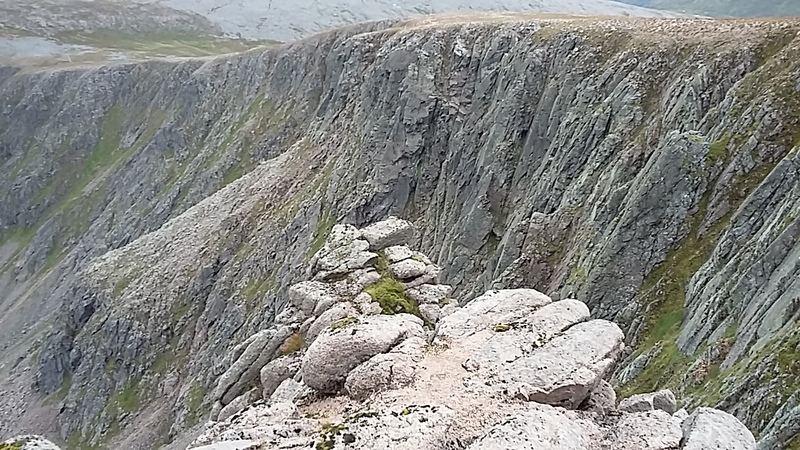 Good to see Coire Bhrochain close up - I have occasionally wondered about ascending through it, but haven't got around to it yet. I find a flapping tent really unsettling as well - completely ruins sleep as it is so irregular. On the other hand, heavy rain or sea/running water can be really relaxing. Thanks for a great read, bringing back many good memories of a magnificent area - done in my case on several separate occasions. That was some meander! a great adventure. I remember feeling pretty knackered on a wintery day on Garbh Bheinn and decided it would be a good idea to empty all my camera gear (which weighed tonne!) and leave it half way on the ridge to collect on the way back down. Needless to say the weather closed in and I spent about an hour before finally finding my bag under a fresh layer of snow!! lesson learned !! HalfManHalfTitanium wrote: Fantastic images of an epic exploration! Thanks Tim, you're too kind. Not so sure about the "epic" handle, but it was certainly a lot of fun. Interesting was the subtle difference in one's mindset when one knows one's next "home" is a tent, rather than a solid (and quiet!) building. dogplodder wrote: Thanks for a great read, bringing back many good memories of a magnificent area - done in my case on several separate occasions. That was some meander! Thanks DP. It is certainly a magnificent area - which I only learned to appreciate last year. I too covered the area over several days... . The "meander" title was really a reference to malky_c's last report. It kind of stimulated me into going for a "no fixed goal" approach - which, when you have to travel 10 hours in each direction to get to the Highlands, is quite a leap in the dark! malky_c wrote: An interesting 'meander' . "meander" title is a nod to your recent report, as I'm sure you realised. 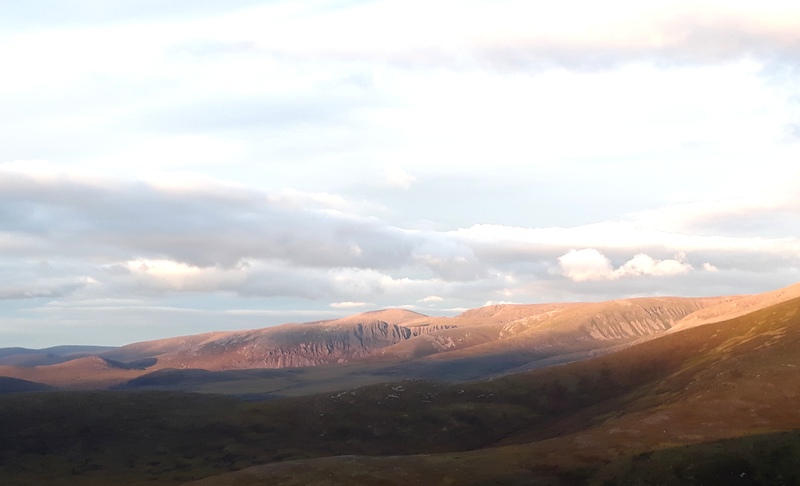 I got a little bit side-tracked into summiting munros, but otherwise I thought it wasn't too far from the spirit of your "meander" - the main difference probably being that the sunsets weren't there, and anyway all I wanted to do at the end of the day was crash! wilkiemurray wrote: a great adventure. I remember feeling pretty knackered on a wintery day on Garbh Bheinn and decided it would be a good idea to empty all my camera gear (which weighed tonne!) and leave it half way on the ridge to collect on the way back down. Needless to say the weather closed in and I spent about an hour before finally finding my bag under a fresh layer of snow!! lesson learned !! Ahh! But you learned the lesson! I did the same with my sac before the out-and-back to Sgurr Dubj Mor the first time I walked the Cuillin Ridge (45 minutes search), and with my camera on multiple occasions, before finally losing it for good on Stob Choire Claurigh (2 hours search). Just stumbled across your Mermaid's Purse of a meander, and it's great reading as ever. How mean of Braeriach to blow a smoke-ring at you with its head all cocky in the sun! Incidentally, someone gave me a book by a chap called Graham Beckett who did a 6-day Cairngorms wander in 1990, starting and ending at the Linn of Dee. He stayed in the long-lost bothies (though rather him than me).